Mitsubishi Forklift Trucks' new FD/FG40N-55N series is a whole new breed of forklift truck that's been built from the ground up to meet the demands of users who require heavy duty, robust and reliable machines. The latest in a series of forklift trucks, the new N-Generation has won accolades from its users for its capacity to work even in the most demanding situations while being friendly to the environment. What's more, these forklift trucks represents the latest in Mitsubishi's transport technology, enhanced safety and commitment to keeping the world green. 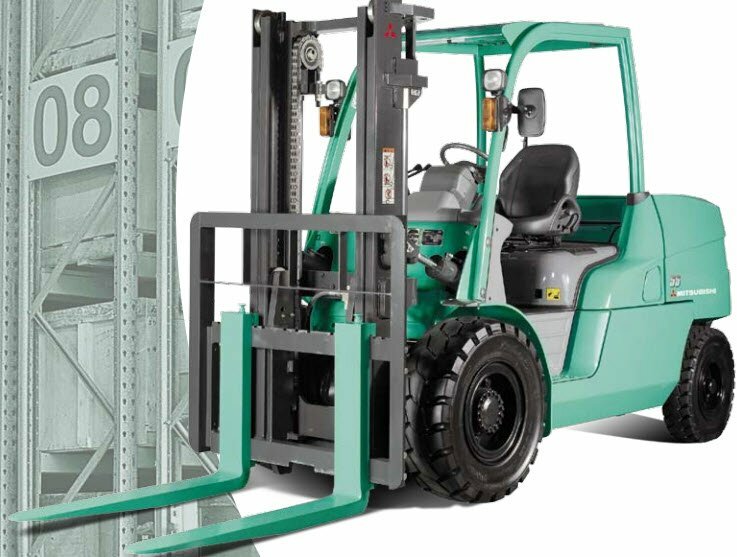 The FD/FG40N-55N forklift trucks — Performance without compromise. 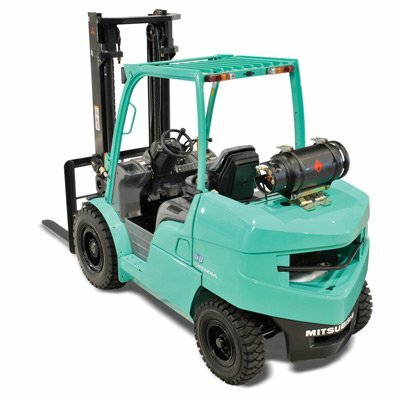 Under the hood of the N-Generation forklift truck is a simple, yet remarkable engine. Mitsubishi Forklift Trucks has developed and refined this robust and reliable power plant while achieving some of the lowest engine emissions in the world. And they've done all this without compromising engine life span, power or ease of maintenance. The Mitsubishi S6S high performance engine, NOx, PM, HC emission can be controlled to comply with new environmental standards without adding common rail technology and other options. While low on emissions, S6S engines are designed to be trouble free with only simple maintenance. 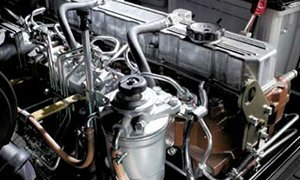 The result: a powerful, clean operating engine with a long life span. Mitsubishi Forklift Trucks' newly designed hardened steel mast rail is extremely strong and resists twisting and bending under loads that would cripple some forklifts. The mast also incorporates trouble free ball-type bushings. These bearings give the mast a longer life span and a longer service interval. Besides the optimum positioning of the mast itself, the main mast's cylinder and chain have been placed out of the way for even better driver vision. Better vision means better safety. The latest stress analysis techniques, together with proven Mitsubishi Forklift Trucks manufacturing technologies have created a long-lasting frame and body with a low centre of gravity. This translates into better performance and enhanced stability when doing heavy work or carrying heavy loads. All N-Generation forklift trucks incorporate a wide, open step made from steel, not fiberglass, into its cab design. A steel step increases durability, prevents slipping and won't crack under pressure like plastics can. Double pin sealing and a one -piece cast housing creates a stronger, tougher forklift truck base. A tougher base provides added protection and support when carrying heavy and demanding loads. The newly developed Flexcontrol system (optional) can automatically slow down truck speed to enable smooth and jerk-free directional changing. And when combined with the wet-disc brakes (optional), the N-Generation forklift trucks have unrivalled handling and stopping control. Designed not only to look good, N-Generation series forklift truck's new sharp form V-shaped counterweight provides exceptional stability and balance while allowing for an easier rear view, as well. The more a driver can see means better workplace safety and fewer accidents. All N-Generation forklift trucks are fitted with a large, heavy-duty radiator core. The radiator's low noise cooling fan along with optimum placement of the muffler make for a highly effective cooling system. Effective cooling translates into longer engine life and less downtime due to overheating. FD/FG40N-55N SERIES cockpits are designed with operator safety in mind and incorporate the maneuverability, comfort and safety that professionals have come to expect from Mitsubishi forklift trucks. Equipped with cornering and steering knob to help prevent accidental steering slippage. Turn signal and headlight switches are combined as in passenger car. Forward / neutral / reverse shift operation is easy with the touch of a finger. Sliding and reclining mechanism to reduce back strain. Wide foot space and better foot pedal position for precise control. Forward 2-speed / Reverse 1-speed automatic transmission. The entire power train, from engine to transmission is secured to the frame by rubber mounts. These specially designed mounts absorb vibration, and make for quieter, smoother forklift truck operation.